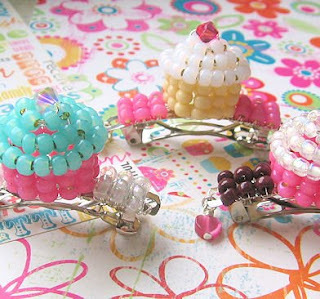 The theme for today is... 'Things that are Sweet'! 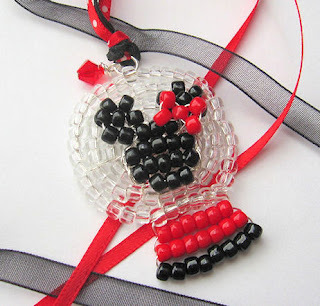 The first sweet thing I would like to share is this new little beaded ornament! It started out as a blue deer with a pink bow at her neck, but really she looks more like... Something else! lol A fox maybe? 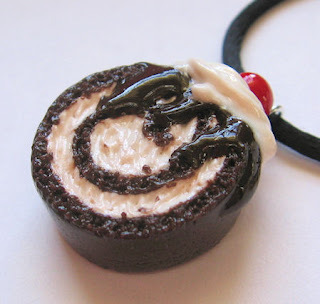 The second sweet thing I want to share is this custom Ice Cream Cake Roll Necklace. It is a custom polymer clay order that I just finished up today! No, it's not real at all... Well, it smells real, like chocolate cake and vanilla cream, but I don't suggest anyone actually try and eat it! ^_^ It was designed from a dessert found at a restaurant called The Chateau. I say 'yum' to that! 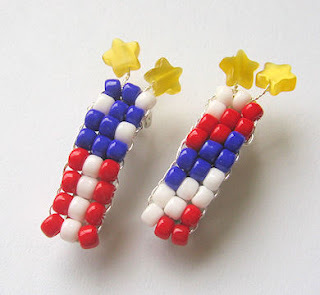 I haven't done any polymer clay items in quite a while. It has been fun to play around with it again after getting a couple of poly clay orders! But... 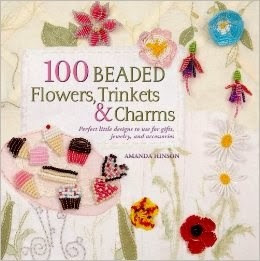 I'm really anxious to get back to my precious seed beads! Hehe... I think they will always be my favorite! 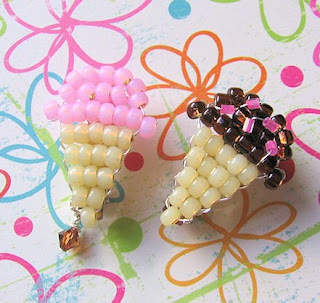 As soon as this polymer clay lollipop order is finished drying, I plan on making a few little beaded jewelry items for my shop, since I've been doing the larger ornaments and barrettes lately. So, look for those next week! I'll be going out of town tomorrow night, and most likely will not be back until late Sunday. So any orders, messages, etc. will be answered/filled as soon as I have time when I get back! I plan on bringing my laptop, so I may have a chance to check emails and convos while I'm there. I will get back to everyone as soon as I can though! And I have been so productive so far during my summer break! Friday we went and saw Wolverine... OMG... Loved it! Then Saturday was DollyWood for a few hours in the evening. We had to get our passes updated for this year. 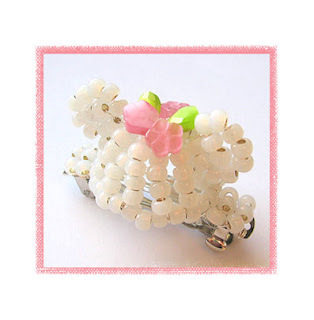 Then Sunday and today were spent working on hair barrettes! For now, I'm going to give in to my sleepiness, and go to bed! And this time a couple of friends are planning on going with me, so it will be a different sort of trip. I'm really excited about it! One of the girls, Cathy, has already been to WDW with me! We went on our Senior Trip together in 2001; one week at Disney's All Star Music Resort. We had a blast! Now we're going back, and (hopefully!) adding one more person to the fun! 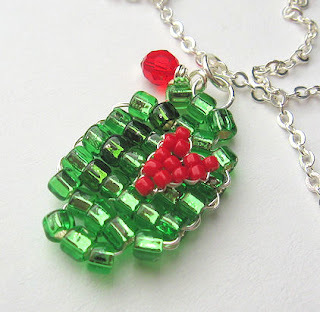 I also made a new item for my shop! 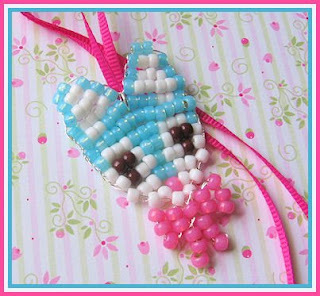 It's a small set of beaded MM ears that I have attached to a 2" barrette. 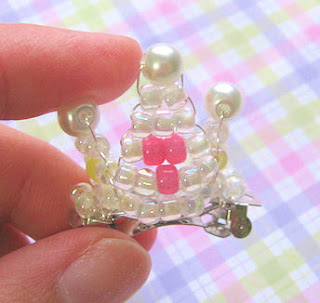 This particular style is based on the old version of wedding/bridal ears that used to be available at Disney World. I'm also working on a version in the 'classic' colors - black ears with red and white bow. I'm [not so] patiently waiting on my black beads to get here so that I can start on those! I'll be sure to post when I finish the ears! And now I'm off to get ready and run some errands! You know, I think I'm one of the few people around here who loves rainy days! I love sitting in my studio, looking out the window at the birds flying around, splashes of rain on their backs as they fly... There is something so comforting and peaceful about it! Speaking of my Etsy shop... I've added a couple of things! I also added a few supplies! I have a couple of large orders right now, but when they are finished, you can bet I will have some new summer treats listed! And speaking of summer... I only have 14 days of work left until summer break! Now that's a happy thought!